Busy Week in The Windy City Exhibiting at IFT18! Today the windy city of Chicago is living up to its name as a nice summer breeze blows outside along Lake Michigan as IFT18 enters its second day at McCormick Place South. 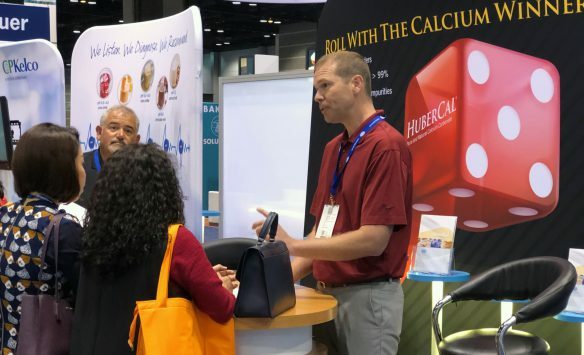 Situated in booth S1341 at one of our favorite annual stops, we’re busy promoting our HuberCal® calcium carbonate powders for food fortification. We offer a diverse selection of HuberCal food grade calcium powders with varying particle sizes and typical properties. Each grade offers a calcium assay of greater than 99 percent and comply with all Food Chemicals Codex requirements. We’ve had a great time thus far in Chicago and look forward to visiting with IFT18 attendees for the remainder of today and all day tomorrow at McCormick. For more information on our HuberCal calcium carbonate product portfolio, click on Contact Us or visit our Product Finder below.